Looking for a job or internship this Spring or Summer? Graduating in May? Join us to find your next opportunity! Employers representing a wide variety of industries will be looking to hire students for hundreds of positions, full time and part time, both on and off campus. Employers are interested in hiring both undergraduate and graduate students across all academic colleges. Visit the Career Studio (PSAC 208) February 11th - 13th for our Resume Blitz to get your resume in tip-top shape. 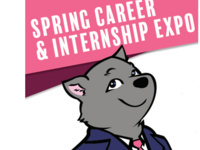 You'll also ge a free Expo Survival Kit with swag from employers to help you prepare! Thanks for the article post.It is very helpful and informative. Once the download is complete, you will have to double click on the files at the location where they have been saved to start the installation process. You will have to key in the copied special code to finish the process. With help from webroot.com/safe you can safeguard several devices at the same time and enjoy a secured online presence. Call HP customer service phone number & get instant support from technical team. Resolve your issues related to HP support or billing on call or chat. Dial hp technical support number toll-free to solve all your tech specific issues and errors without any delay. The team of experienced experts is available 24X7.